Here at Wild Oat Hollow we not only believe the food we eat is incredibly important to our health, we would also argue that the products you use to clean and moisturize your body are extremely important as well. So we are offering our simple, organic lotion and soaps for sale. 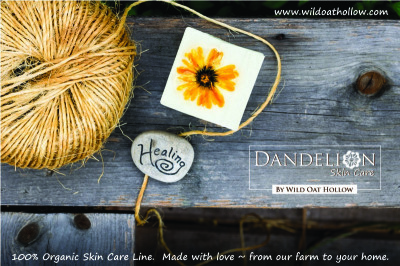 The lavender lotion by Dandelion from Wild Oat Hollow far exceeded my expectations. My friend Sarah Keizer, the Rural Chick farmer, had the most beautiful healthy looking face. I credited her smooth tanned glow with her youth, diet and active outdoor lifestyle. Now I know her other secret because it happened to my older skin too! It is this lotion she creates from organic ingredients, including tomato, olive, beeswax, coconut, lanolin, carrot and lavender. This lotion is so versatile and thirst quenching that it makes as excellent of a day cream as night cream. It is so gentle and fortifying that I now prefer it over Dr. Haushka’s $50/ounce eye cream, which I used to swear by. Dandelion lavender lotion does not irritate my eyes, at all, even if it creeps in. If applied at least twice a day, your skin will be radiant! We make luxurious, rich lotion that is beneficial to all skin types. Our carriers oils, hemp & olive oils rest in a sunny ​window sill for 6 weeks with a variety of herbs that support healthy skin before we use the oil in our lotion. We make small batches of lotion with organic ingredients and cater to skin with special needs. This lotion will leave your skin soft and hydrated without that greasy feeling. 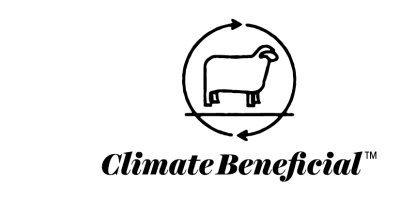 Our Transitional Climate Beneficial soap is simply wonderful. 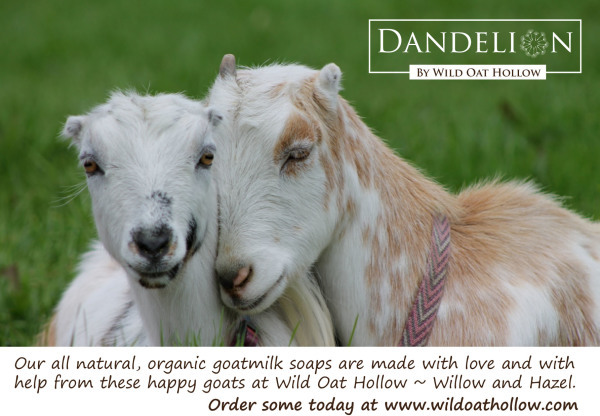 We make cold process goat milk soap that is soothing and hydrating to all skin types. We make all of our soaps in small batches, making sure the soaps retain all of the benefits of the oils. All or our ingredients are from our farm or surrounding farms in Sonoma County, using sustainable methods. One of these sustainable ingredients products is lard and beef tallow. Yes, lard and tallow from local, pasture raised animals is a wonderful ingredient. Making for a luxurious and sudsy soap. The secondary ingredient is goat milk from China, Sandy, Alice and Hazel! We get our olive oil from Figone's in Sonoma. All of the ingredients are organic and sustainable from farms working to build soil and sequester carbon. Because we only use these ingredients our soap is Transistional Climate Beneficial. These are luxurious soaps that are great for your skin and a product made with carbon sequestering. A soap you can enjoy for yourself and your climate. We started out with a few Romney sheep as they are hearty, do well in our wet winters and are a great example of a dual purpose sheep. And we fell in love with their vitality and their wool. They have amazing fiber, with great luster, attachment and long staples. Perfect for the hand spinner. After playing with their fiber for a while I decided to venture out into the fiber/sheep world and try some new breeds. We have now added a beautiful Wenslydate ewe and a Lincoln/Cormo/Moraino/Wensleydale cross ewe. The cross bred ewe is from Peggy Agnew in Potter Valley. She has been breeding these sheep as the perfect fleece for the hand spinner for a long time. I feel so blessed to have obtained one of her ewes!! Now I have decided to add several merinos to our flock. We look forward to having amazing Romney and Merino fiber for the hand spinner. 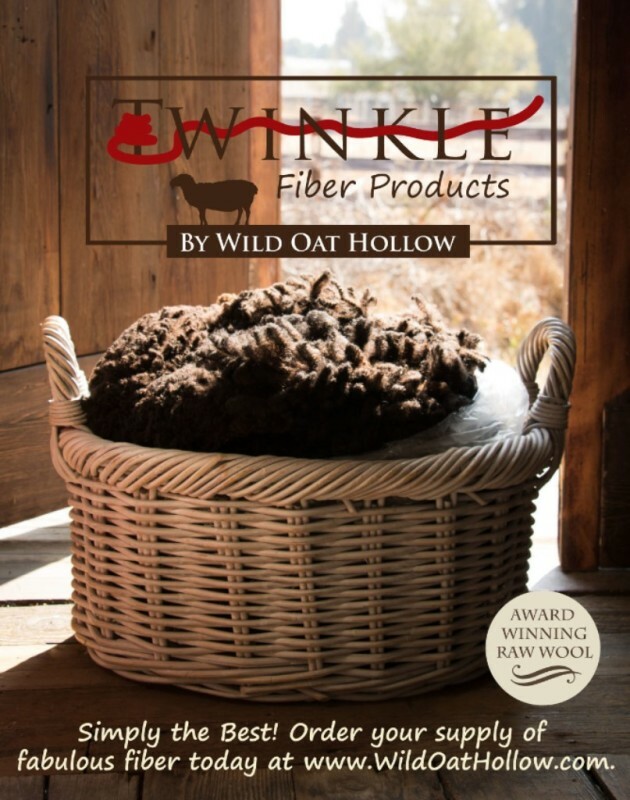 As we grow our herd we will introduce some yarn and sheep skins to our fiber sales.